I am Margit van Wessel and I work at Wageningen University (the Netherlands). From 2012 to 2015 I was part of a team of 10 evaluators conducting a joint evaluation of 8 advocacy programmes in the field of International Development, supported by the Netherlands Ministry of Foreign Affairs. Being an evaluation of advocacy for development at an unprecedented scale, this evaluation offered opportunities to improve our understanding of advocacy for development and to contribute to better methods for its evaluation. 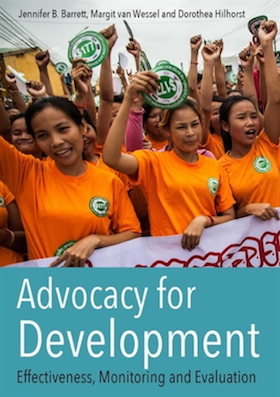 Team members Jennifer Barrett, Thea Hilhorst and myself drew out the most important lessons and published a free e-book presenting these, Advocacy for Development. Effectiveness, Monitoring and Evaluation. The nature of advocacy work and advocacy achievements demands an approach that does justice to the flexibility required for advocacy, the multiplicity of relations involved, the long-term orientation needed when it comes to seeking change, and the highly political nature of the work. Advocacy for Development seeks to reconcile two positions on evaluation that are sometimes in opposition: the linear evaluation tradition, which compares outcomes at a certain moment in time against a set of objectives, and approaches that incorporate complexity and adaptation. Lesson Learned: In the complex realities of governance, relations between civil society organizations, decision makers and other actors often defy a simple relation of advocates influencing targets, and engagements and interactions are diverse, dynamic and often long-term. When monitoring, adjusting, and evaluating advocacy programmes, funders, advocates, and evaluators can develop understanding and proper judgment engaging with Theories of Change and advocates’ ways of strategizing in the face of challenges. Hot Tip: A programme’s theory of change can also be used as a first point of reference to assess relevance of outcomes, but this requires critical reflection, as findings of relevance in light of theory of change do not guarantee that outcomes will be relevant from the perspective of partners and constituencies. Communication, collaboration, and accountability with partners and constituents need to be an integral part of monitoring and evaluation of relevance. Lesson Learned: Contribution analysis is sometimes the only workable way to assess a programme’s role and added value. However, contribution analysis of advocacy programmes present challenges in terms of feasibility and applicability. Funders, advocates and evaluators should reflect on these challenges to set realistic goals for establishing contribution. Efficiency is an important consideration for all organisations, but assessing efficiency of advocacy programmes can be difficult because of the lack of benchmarks. Using a theory of efficiency (explained in the ebook) can make explicit how an organisation intends to work towards efficiency and to assess what is done in practice to maintain and improve efficiency. Thanks Benedictus! The link has been updated!